Baby Shower Desserts can be tasty, nutritious and also serve as your decorations or centerpiece too! Take a look at our ideas for fruit themed desserts as well as baby shower cakes and cupcakes and candy ideas too! There is a big assortment below! Plus see how to make a baby shower diaper cake.. you can't eat it but it is a great centerpiece and the expectant Mom will love to bring home all the diapers! One of our favorite baby shower dessert was submitted by one of our Celebration Ideas Online fans.. Darcy from California. Take a look at this shower dessert idea where you turn an assortment of fruits into your Baby Shower decoration or centerpiece! How great is this and so easy too! Look at this! How easy and healthy too! First take a watermelon and cut out the large L shaped piece to form the cradle. Then, scallop the top to make the carriage hood. Next scoop out all the fruit.. save it and cut into bite sized pieces to add to display. We loved how you can use a half of a melon ball for a nose! We made the "double" with 2 babies for our baby shower for twins! To make the "Baby" or in our case since it is twins, "Babies".. use small snap apples...toothpick in blueberries for eyes, add eyebrows with a Sharpie marker and cut a hole for the pacifiers! Wrap them in romaine lettuce leaves to form their bonnets and pop them in the carriage! Cut 4 orange slices to form the wheels and toothpick them in with grapes to form the center spoke of the wheel.. Presto.. a beautiful baby shower dessert that can be the centerpiece of your baby shower dessert table! Drum roll please.... here is the final display.. added those University of Michigan pacifiers in honor of Grandpa, their Godfather Rich and their parents.. all Michigan alumni.. GO BLUE! Add a "Cake Topper" to your cake! Look at this cute cake. We bought a plain sheet cake at the grocery and a very talented friend made this adorable cake topper that we set on top of it. Our theme for the twins was an OctTWOberfest with a pumpkin themed cake! Make baby shower cupcakes into a baby rattle.. so easy and love that you can color the cupcakes to fit your theme.. see how to make this adorable baby shower dessert! How about adding a color themed Candy Buffet to your baby shower.. These are popular at weddings but would be fun and festive to your shower.. best of all, the take home candy is your favor! Learn how to put together a candy buffet for your baby shower!﻿ See how we made these adorable chocolate candy favors for recent baby showers. If you can print an address label you can turn small Hersheys chocolate bars into baby shower candy! Look at this cute baby shower cake with the invitation displayed right next to it.. love this! Here are some suggestions for a menu for your shower, as well as a great tip about how to cut a layer cake! We used this menu for a bridal shower, but works just as well for a baby shower! Here are some adorable Baby Shower Cakes for our Mother to BEE shower theme! Our expectant couple chose to wait to learn the gender upon delivery.. so our What Will It Bee? cake was just too cute! See how we made Mother to Bee baby shower favors to match the theme.. they were easy, inexpensive and a huge hit with our guests! Nope, not an edible dessert but cutest centerpiece for your dessert table.. a diaper cake.. pretty to look at and practical for Mom to take home! Learn how to make a Baby shower Diaper Cake .. our free E-Book gives you the recipe with step by step instructions! 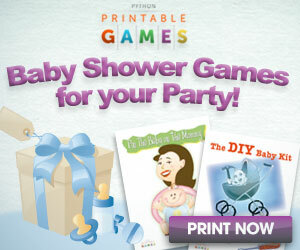 A great place for Baby Shower stuff and a coupon!